When I was about..... I have to say 14ish.. maybe 15 I met a guy who was a new college student at my church. He was a really amazing person.. and I quickly started to think of him as a big brother. We called him Dusty but his name is Paul. Over the last 10 or so years I have seen him grow into even a better man, and eventually husband to a wonderful woman Bekah and then a father to two beautiful little girls. Well now that same guy and his wonderful wife are trying to adopt a little boy from Russia who is HIV+. When I really think about that it is such an amazingly open and loving thing to even attempt to do. Most people do not have room in their heart for a child they did not create let alone one with HIV. I actually was in tears reading the posts on their blog about how excited and happy they are to be trying to adopt. However adopting from overseas is very very hard and expensive. There are many ways however that you can help them. First of all go to their website. You can also check out their coffee shop. 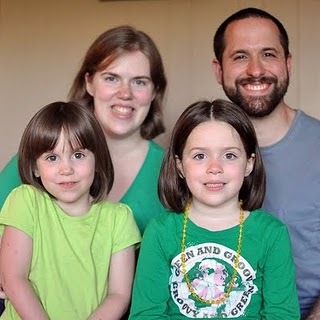 They are wonderful people and wonderful parents (also super Green so that is great too). I know that they would be wonderful parents to this little boy too. Please consider helping their cause.